We attended our first Japanese festival last night, the Fussa Tanabata Festival, held in our town. 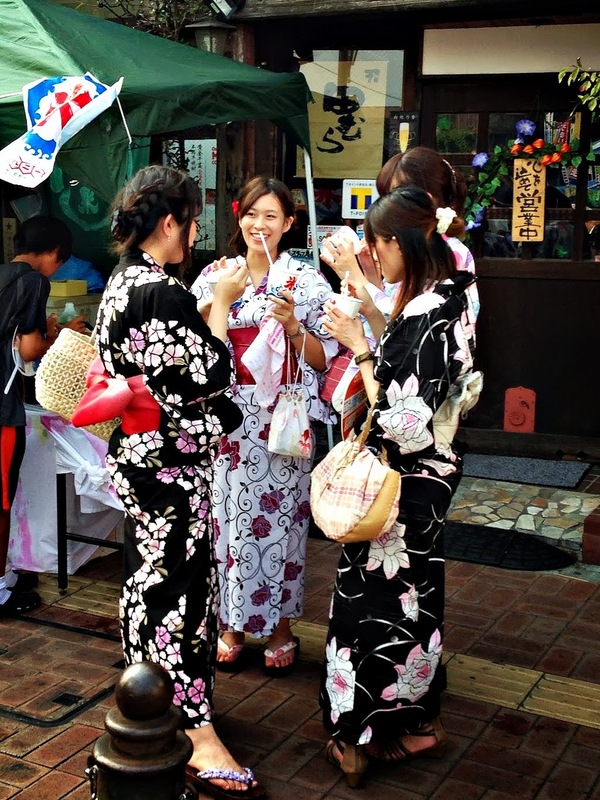 The Japanese have hundreds of festivals every year, usually celebrating some different spiritual event. The tanabata festival means “festival of the stars”. The streets were closed to cars, and there were decorations hanging from just about everything. There were lots of these little fish ponds for kids. They would catch them in a net and take them home in a little plastic bag of water. We couldn’t decide if they were pets or dinner! Lots of characters walking around. And, of course, dancing girls. Many of the Japanese were wearing traditional kimono and yukata, I LOVED this! SO many food stalls, it was a great way to sample different foods. My personal favorite was this cucumber on a stick, with some sort of wasabi paste smeared on it. We loved the chocolate covered bananas, too! No tables around, you just sort of sat where you could. At dusk all of the lanterns started to light up. Very pretty! On our walk back home, we passed this lovely outdoor patio with a very American sounding jazz band playing. They were fabulous, I could have sat there all night! We always see this house on our way to the train station. I love it! The only drawback to the evening was the humid heat! Matt’s shirt and shorts should give you some idea of how sticky the air was. It looked like he stood in a shower with his clothes on, poor Matt! Previous Post Awesome mall food?! Great work on your blog! Enjoying it very much! Yes indeed! Glad you finally found someone to take pity and show you how to navigate Blogger! ;)We like the updates of Life in Japan! Thanks! I am glad you guys like it!